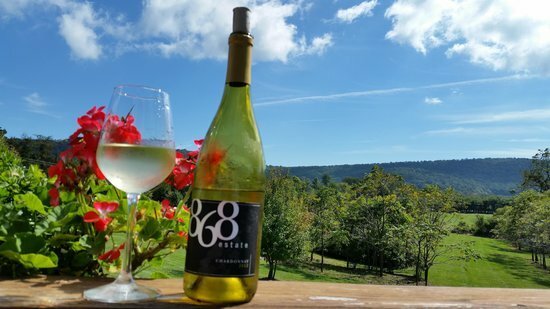 With offerings ranging from freshly baked baguettes and farm-fresh cheeses all the way to arctic char and filet mignon, the wineries of Loudoun County lead the way in pairing flavorful wines with the best fresh, locally-sourced food. Explore guided tastings and private tours, discover on-site restaurants, and savor a wealth of a la carte and picnic selections. Fabbioli regulary offers tastings of seven wines paired with gourmet food bites. A dedicated wine server guides the seated tasting, providing an educational overview of the art of pairing. Cheese and charcuterie plates, baguettes, gourmet cheeses and spreads, salami, prosciutto, chocolates and other refreshments can be purchased a la carte. Vegetarian and gluten-free options are available. 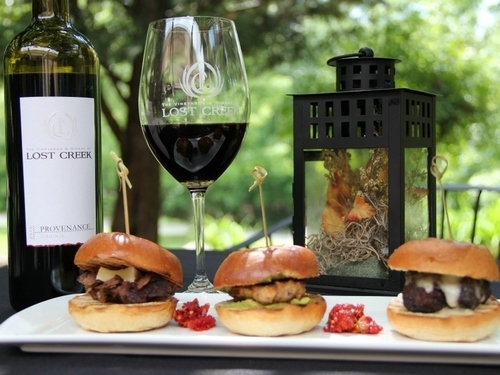 Lost Creek offers an impressive menu of goodies to enjoy in the tasting room, as well as gourmet sandwiches to take out on picnics. The menu ranges from snacks such as imported cheese and charcuterie and a crostini trio to salad, sliders, and a tempting Wine Country Chicken or Beef Burgundy. The menu was designed to pair with Lost Creek wines. Crushed Cellars always has homemade bread with local dips and spreads on the tasting bar. You will also find local and imported cheeses, fresh bread, and an assortment of bruschetta and dips available for purchase. Chuck and Ana Cardamon are the kind of people you want as neighbors when picnic time rolls around. They've got wine - grape wines, fruit wines, and mead - but they didn't stop there. 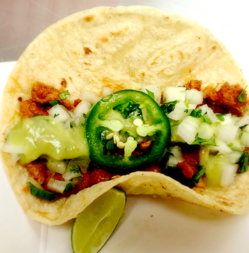 Each weekend brings a selection of mouth watering Mexican Street Tacos, and they literally wrote the book on salsa; their recipes for salsa, from sweet to savory, fill their cookbook, Salsavino, which you can also pick up in the tasting room. The owner’s Turkish heritage is reflected in the weekend menu that showcases fresh Mediterranean/French influences. 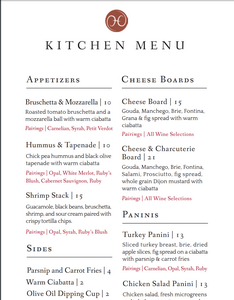 Bruschetta, hummus, tapenade, paninis and more are made-to-order. Available to purchase a la carte are items such as domestic and imported cheeses, sausages, pates, spreads, chocolates, and crackers. The well-regarded Grandale Vintner's Table Restaurant is located on the 868 estate. Entrees such as duck breast, filet mignon and arctic char are on offer here. A casual food venue, The Grill, is located outside in the Pavilion, serving burgers, bbq and other light fare from May through October. 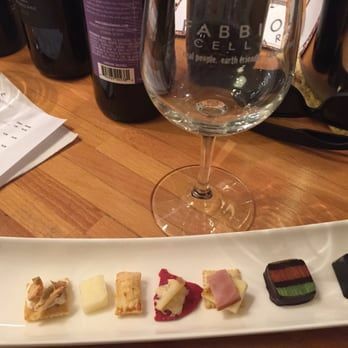 In the tasting room, a pairing of 6 wines with five bites of both savories and sweets is available, as is a wine and chocolate truffle tasting. 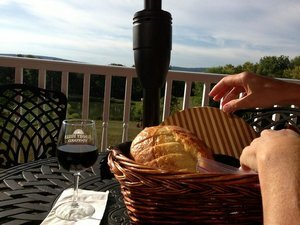 Sunset Hills offers food baskets you can mix and match to your taste and enjoy on the sunny deck or at picnic tables on the shaded lawn. Select from freshly baked bread, crackers, or imported meats and cheeses and tapenade. Gluten-free items are available. Flatbread pizzas, plates of Italian burrata with tapenade and baked brie, and cheese and charcuterie plates are offered at Bluemont. A la carte offerings range from honey chocolate truffles to farmers cheese, three types of imported salami, olive oil on tap, spreads, tapenades, chips, and crackers. Greenhill’s “Grapes to Glass Tour” includes a visit to the barrel room, vineyards, and members-only historic manor house, with an introduction to Greenhill’s winemaking processes. The tour culminates with a charcuterie plate of gourmet meats and cheeses. 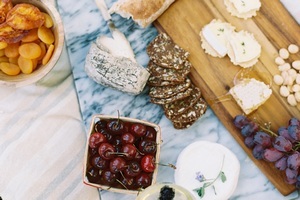 In addition, cheeses, charcuterie, and crackers are available at both the Manor House and Tasting Room. The winery’s pizza shop, Quattro, is located right inside. 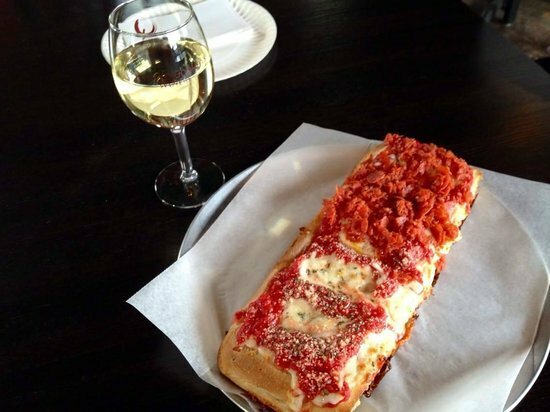 Square-cut, Sicilian pizza - west Pennsylvania-style - has a crisp bottom and light and airy crust. A unique blend of mozzarella, provolone, and romano tops a sauce made with hand-picked tomatoes. Optional toppings include Grandma G’s ground pepperoni, hot pepper rings and jalapenos. Also available: baguettes baked fresh daily, and handmade farmstead whole-milk cheeses from Goot Essa. 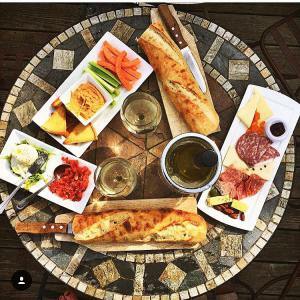 Breaux Vineyards sells the traditional cheese, bread, meats, and chocolates, but ups the game with a menu of hot items that change weekly, including panini, brisket, BBQ, Jambalaya, and baked pretzels. At the tasting bar, you'll find a truffle and wine tasting option. Have some favorite winery food pairings you'd like to share? Let us know on our Facebook page, or share your pix with us on Instagram! Three Days in Spotsylvania: Wine, War, and Where in the World is Stonewall’s Arm?